Breakfast is my four-year-old’s least favorite meal of the day. She has her mom’s grumpy reaction to low blood sugar (sorry, kiddo – and if you’re reading between the lines, that makes two of us who aren’t much fun before breakfast). Instead of being eager to eat one of the Many! Delicious! Choices! I offer her, she can tailspin into a mode where she doesn’t want anything. Even though part of me wants to insist that oatmeal and toast are just what life has to offer for breakfast most days, I love how much smoother our morning is when there are breakfast cookies/muffins/things that are not oatmeal or toast around, because as soon as she gets some calories she’s a rather delightful kid. SO, I’ve tried a lot of recipes for whole grain, lower-sugar versions of those foods, so I know that she’s getting a healthy breakfast even if it tastes like a treat. 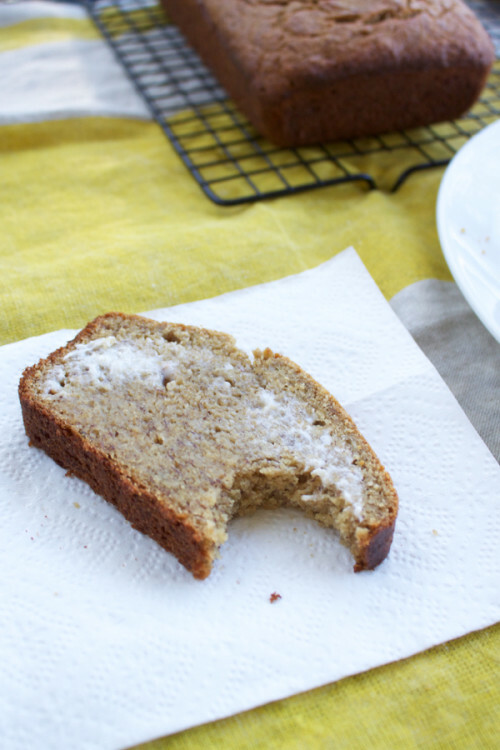 This whole wheat banana bread is one of our favorites! It uses all whole wheat flour, just 1/4 cup of brown sugar and 1/4 cup of honey (or maple syrup) per loaf, and of course, your decomposing overripe bananas! I wanted to make a double batch, so I mashed up 6 bananas – only to discover that I only had 2 eggs (but needed 4), NO honey, and my mixer bowl was in the fridge full of leftover chocolate icing (which, btw, turns rock hard in the fridge). Waaahhh! #planningaheadfail But since I had already done the hard part – the touching the bananas part (yeah, I have to wash my hands every time I touch a banana), I forged ahead. Fortunately, my mom lives next door and loaned me the eggs, and I experimented with maple syrup instead of honey and it worked like a charm. Banana bread crisis averted. If, you know, you have all the ingredients and aren’t chipping chocolate icing out of your bowl with a butter knife, it doesn’t take long to mix up the batter and for your house to start smelling sweet, toasty, and delicious! Preheat the oven to 350 and lightly grease a 9×5 loaf pan. In a large bowl, beat the butter and brown sugar until smooth. 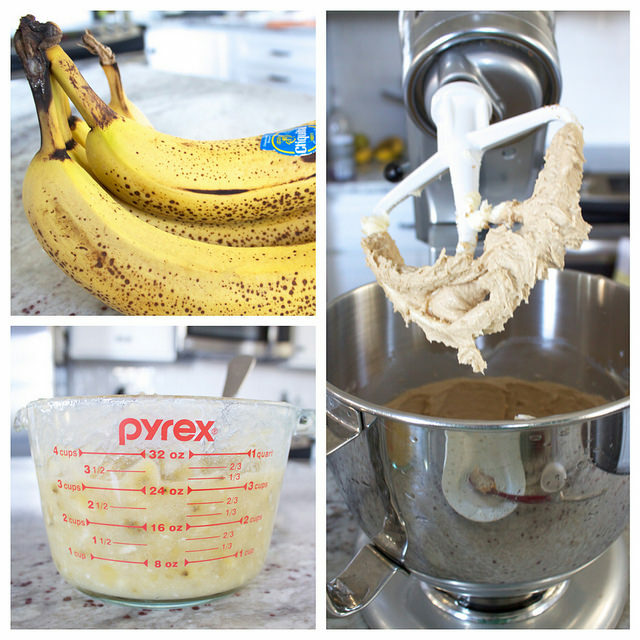 Add the vanilla, baking soda, salt and bananas and mix well until thoroughly combined. (The batter will look weird and there may be clumpy bits of butter, but it will come together at the end!) Add the honey and eggs and beat to combine. Gently stir in the flour until combined. 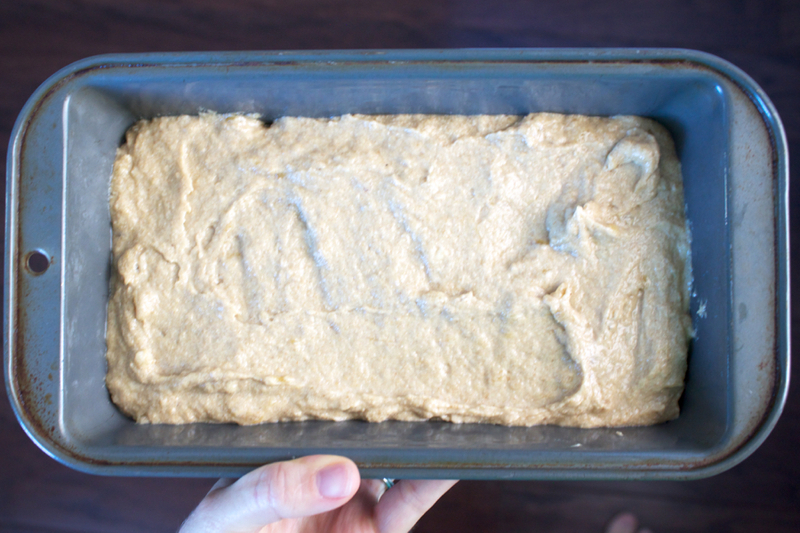 Transfer the batter to the loaf pan, then let the batter rest for 10 minutes. Bake for 50 minutes. Check the loaf and if it’s browning too quickly, tent it with foil. Bake for 5-10 minutes longer or until a toothpick comes out clean. Cool the banana bread in the pan for 10 minutes, then turn it out onto a rack and cool completely. 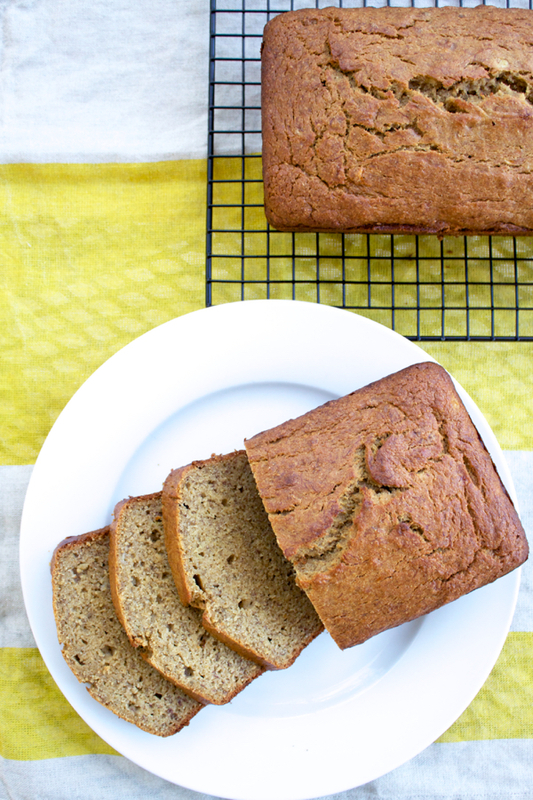 This recipe is slightly adapted from King Arthur Flour’s Heavenly Healthy Banana Bread. To make 12 muffins, bake 20-25 minutes. You could certainly throw in 1/2 cup or so of chopped nuts or even chocolate chips if that’s your thing! The banana bread freezes well, so I often double the recipe.